In Windows 7 the default word processing program is WordPad which offers basic features including font and paragraph controls. The default settings are fixed and not easily changed by the average user. This article shows a work-around for “pre-setting” font and paragraph properties to more desirable settings. The approach creates a desktop shortcut for WordPad that opens a “template” document, thus loading the desired settings. The template is set to read-only so is is not accidentally over-written when the document is saved. 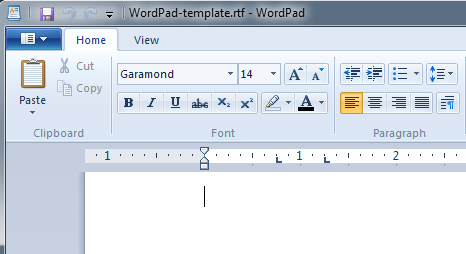 Open WordPad in the normal manner. Set the desired features such as font, font size, paragraph spacing, tab positions, without typing any text. 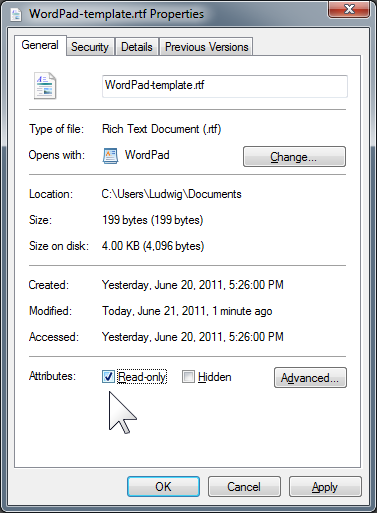 Save the document to your normal document folder using a name such as “WordPad-template”. Open Windows Explorer and locate the “My Documents” folder (or the folder you are using for documents). Locate the file and right-click on it. Click Properties (at the bottom of the menu). In the properties dialog click Read-only so the box is checked. Click in the address bar of Windows Explorer. The folder location will be shown and selected. Click Ctrl+C to copy the folder address for use later. Now your template file is ready. The next step is to create a shortcut on the desktop that starts WordPad and loads the template file. Click Start, type “wordpad”. 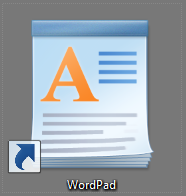 WordPad will be listed at the top of the start menu and be already selected. Right-click on that program listing for WordPad. Move the pointer down to Send to then to the right and click on Desktop (create shortcut). Right-click the newly created shortcut icon and click on Properties (at the bottom of the menu). The WordPad Properties dialog opens with the Shortcut tab selected. Find the Target: text box. Click anywhere in the box and press the End key to get to the end of the text that is already in the box. Press the spacebar to enter a space then type in the full name of your template file. You can see that illustrated here. I have enclosed my template file name in quotes, this is only necessary if the file name contains spaces, but it does not hurt. Locate the Start in: text box. Click in the box then press Ctrl+V to paste the saved address of your documents folder. Your shortcut is now ready to use. Every time you double-click this shortcut WordPad opens and loads the template file. Your presets will be applied to any text you enter. You can still use all the controls. So you can safely and effectively use this approach to preset WordPad to the font and other properties that you prefer. This entry was posted in Windows 7 and tagged change WordPad defaults, default font, default settings, Wondows 7, WordPad by Ludwig. Bookmark the permalink. My file is in the Documents Folder? 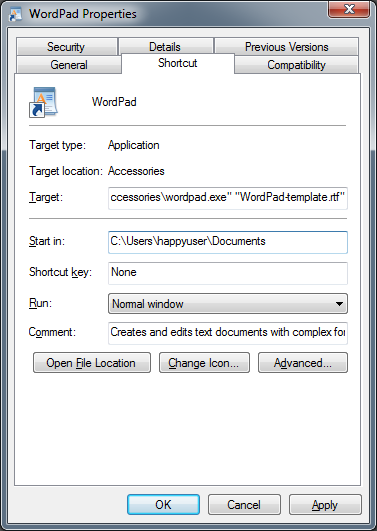 It seems that you put the “WordPad-Template” file name into the “Start in” box instead of appending it to the “Target” text. The actual template should be placed into the normal Documents folder and that folder should be where WordPad normally starts. Go though the procedure again, step by step, carefully. If you cannot find and correct you problem, please get in touch with me via the Ask Ludwig link (upper right). Leave ‘Start In’ as it is already automatically filled in. The desktop shortcut takes me to the Documents Folder, where the Template is Listed.